This week's $8000 went into low yielding stocks with high growth. Much of the cash came from tax loss harvesting positions. Cash is also coming into the 401k account and I will be buying utilities SO (4.8%) and D (3.8%) to balance the low yield of NVO and CVS. Walmart was sold to tax loss harvest. I also wanted out because of its low earnings growth and dividend growth. I replaced some of the Walmart proceeds with the healthcare store CVS which has high growth consistency and earnings but lower dividend. GILD and AMGN were speculative positions that were traded for NVO for higher consistency and quality. I did not lose or gain in this trade. UNP was sold to tax loss harvest and I wish to add to CNI if I had additional funds. Below are some plots showing the consistency of NVO and CVS. Although past results do not indicate future returns, they still demonstrate how capable the company is to cope with difficult situations. 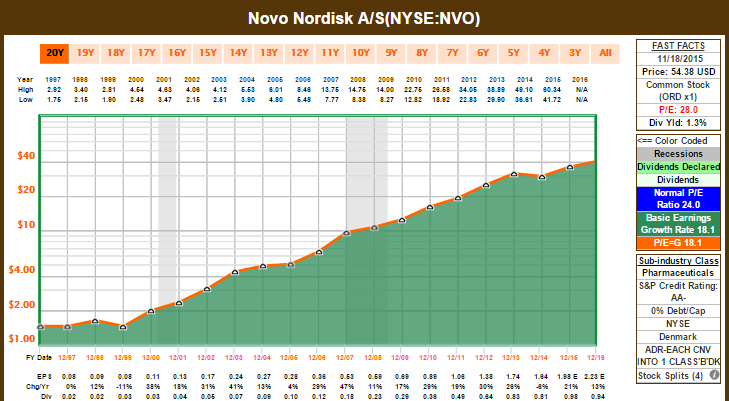 The NVO business is very consistent and predictable. Their CAGR is around 20%, which spans many decades, including the many many recessions. Note that the plots are in log scale so the actual results have been exponential. NVO manufacturers medicine for Diabetes and hormonal treatment. The company has next to no debt, a AA- credit rating by S&P, and A++ financial rating by Value Line. The company is situated in Denmark so it pays its dividends in Krone. Their dividends have been increasing for many years but are still subject to foreign exchange rates. Below is a plot of CVS's earnings growth. 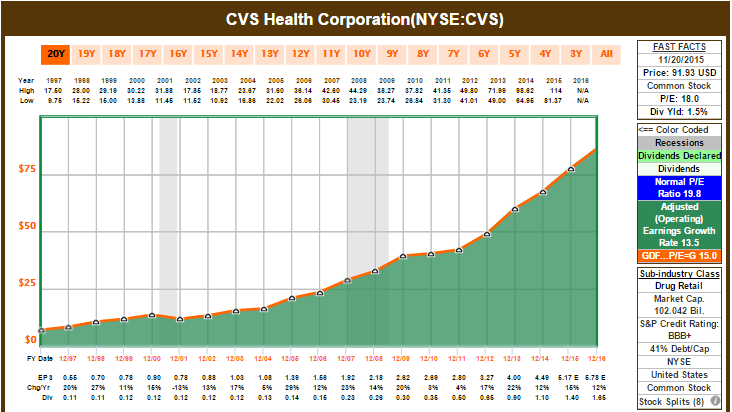 This is in linear scale and shows that CVS has been able to consistently increase its earnings at a stable rate. At this time, I have around -$2500 tax loss dollars that I can deduct from my income next year. That will allow me to get around an additional $830 in my tax refund check. In the weeks to come, I will see if there are other stocks I wish to swap to hit the maximum $3000 tax loss harvest limit. 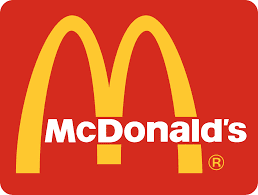 McDonald's announced today that they have raised their quarterly dividend from $0.85 to $0.89. That is a 4.7% increase over last year's values. It's not great but not terrible either in my opinion. The company is undergoing a large makeover under the new CEO and I still expect earnings to be unexciting for several more quarters. The share prices have risen tremendously over the last several weeks though, not really in line with the present earnings. Investors seem to be confident about the future of McDonald's. At the moment, MCD is too expensive for me to consider buying. S&P have also reduced MCD's credit rating from A- to BBB+ due to the added debt, which does not please me greatly. MCD have also stated that they do not plan to pursue a REIT transaction that many were hoping for. This week I have started tax harvesting. I have up to $3000 of losses I can lock in this year to reduce my taxable income for this year. I estimate that for every $3 I claim as losses, I can get $1 back due to the tax deduction. As of now, I have around $1000 of my $3000 used up for tax loss harvesting (includes the KMI & PX sold, and some of the other few trades that happened earlier in the year). I pay $1 per purchase on Tuesday morning, so spraying this many purchases on other brokerages may not be ideal for others. Before performing tax loss harvesting, please consult with others and do research first to understand the pros and cons. The jobs report released this morning showed a large jobs beat. As a result, there is an expectation that a rate hike is a possibility leading many companies that are like low debt to drop in value. REITs and Utilities took a huge hit today with losses ranging from -3 to -6%. I feel that there will be more valued buys to come. Here is a chart of stocks I am eyeing at the moment. I want to add to my utility sector this time around. My plan in the coming weeks is to steadily add into my favorite utility companies. This will help increase my dividend yield because utility stocks have high yields. My three "core" utility stocks are D, NEE, and SO. Below are plots of their price charts and dividend history. These are two other utilities I watch but I like them less than the top 3. October wasn't a very good looking month in the beginning. I was able to add some on the S&P500 lows but not as much as I would have liked. 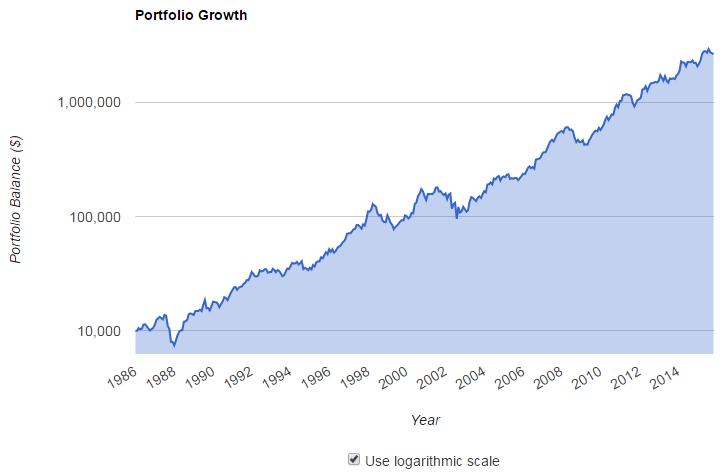 My portfolio rebounded at the end of the month and has set new highs. Currently I sit at around $138,000 after paying for last month's bills. 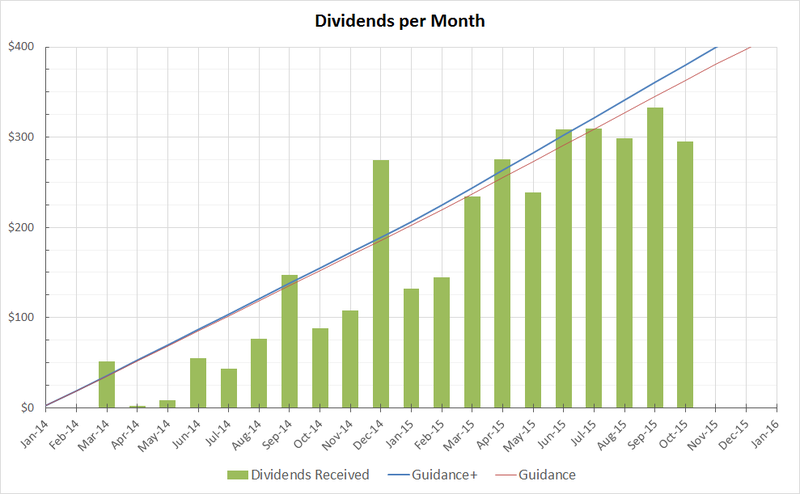 My forward yearly dividend income now sits at over $4,100. I have been struggling to find good names to add in the current environment. 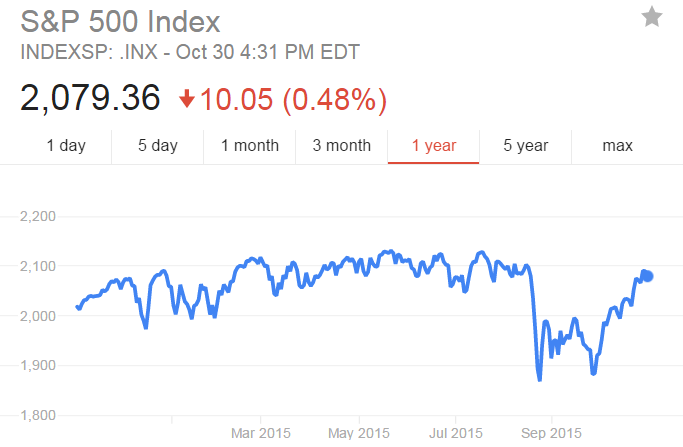 A lot of stocks that were looking attractive at the bottoms of September now are too expensive. With the higher price, the yield on potential stocks are also lower. I have been trying to remain at 3% or higher on average for new buys. Another month and another bucket of cash received from several of my holdings. All of these dividends were reinvested back to their original holdings. In October, several of my holdings announced dividend increases. These include KMI, VFC, and V.
The total comes out very close to $300 this month. My largest payers were from the two tobacco companies I own.